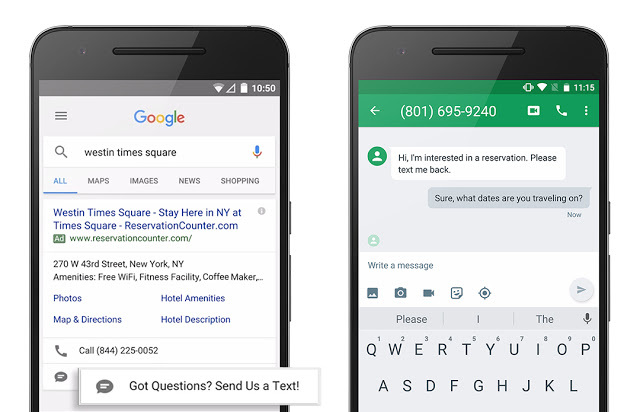 A few weeks ago we reported that Google was testing message extensions on mobile. Well, it looks like testing went well, because they’ve just announced that this will start rolling out across the globe in the next few weeks. Notice the new placement of the call and message extensions in cards below the main ad? You’ll also notice the call to action in the extension text – that’s new too. Google says it will allow advertisers to edit the call to action and also to set up an initial, automated text that will appear in the message box after a user clicks the extension. Users will be able to edit that pre-populated message before sending, but it’s an opportunity for you to help users save time typing. Google has released a best practices guide to go along with this announcement, so we recommend you have a look at that before getting started. Businesses that run Google ads on mobile. This is new extension provides a new way for your customers to contact you, so you should care a great deal. With this text option you’re likely to get leads you wouldn’t ordinarily have got (like those who have a question for you but wouldn’t have made a phone call to find out). It’s also a useful feature if you don’t have someone available to take calls 24/7 as you can set up an automated text response, and will appeal to customers who are phone-shy. We suggest you read the best practice guide and get started with is as soon as it becomes available to you. Our resident wordsmith’s love of digital lured her over from advertising to the online space, where she fell in love with content marketing. Since coming to the online world Steph has made her mark on all outgoing CleverClicks copy and is passionate about using words to build brands. Her obsession with the writing is rivaled only by her love of trail running, yoga and green juice. When she’s not submerged in content strategy you’ll find Steph in Downward Dog. Plug the holes in your sales funnel and boost traffic, engagement, leads and conversions conversions conversions.